Kimi Raikkonen has admitted Stefano Domenicali’s departure from the Ferrari Formula 1 team took him by a surprise, though he does not think it will disrupt the squad. 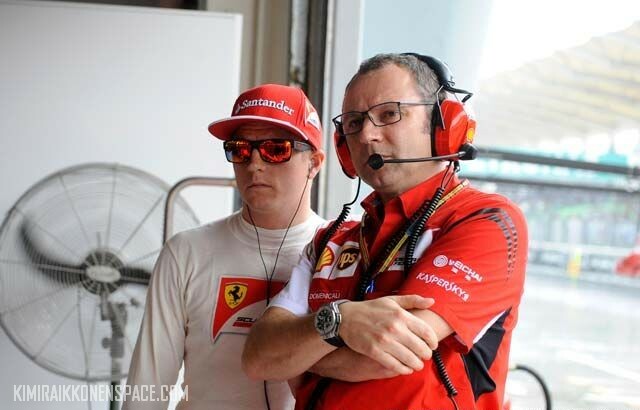 Domenicali resigned earlier this week in response to Ferrari’s poor start to the F1 season. He has been replaced by Marco Mattiacci, formerly CEO of Ferrari’s North American operations. “I think everyone is a bit surprised but obviously it was Stefano’s own decision as I understand it,” said Raikkonen when asked by AUTOSPORT for his reaction to the shake-up. “If he felt like that, fair enough. Life goes on. “He was a great guy. I worked with him for many years and I spoke to him often. But that’s how it goes. Raikkonen said he knew little about Mattiacci – “I don’t know him. We’ve probably met before” – but thinks Ferrari’s management structure will ensure a seamless transition. “He’s got great people around him to help him so I don’t see that there will be any issues,” he said. The Finn backed team-mate Fernando Alonso’s insistence that replacing Domenicali with Mattiacci would not have an immediate impact on Ferrari’s form, although he believes steady progress is being made. “Even if you change things around, you cannot make a miracle because we know where we are and we have to improve. It won’t change overnight,” said Raikkonen. “In the rules there is quite a lot of space for improvement. We can find quite big things suddenly. But it might be the same thing for other teams. “We understand things better after a few races and we have already improved a lot since the first race. Obviously it’s hard to see it when everyone is doing the same.